My daughter, she loves to strike a pose. I snapped these pics of her one day when I was actually trying to snap some pics of my littlest daughter in her little strawberry outfit. These photos below were totally accidental and impromptu and totally exemplify my oldest. This week's Sketchy Thursday sketch was too perfect for this photo sequence. I love that they are including more 2-page layouts BUT don't let that scare you away...you can totally choose to do a one pager and still be eligible for the prize. Supplies: Little Yellow Bicycle Twig Collection: Woods, Wood You Be Mine - Sky, Diamond Dust, Leaf a Note papers; chipboard stickers embellishments; crepe paper lace stickers; cardstock stickers fresh verse. I had bought some Little Yellow Bicycle Twig collection but couldn't quite find the right fit for them...until now. The colors were soo right and the sentiments were even better. Make sure to take a look at what some of the other design team members did with this Sketchy Thursdays sketch AND play along for a chance to win a great prize from Sweet Peach Crop Shop! Beautiful! 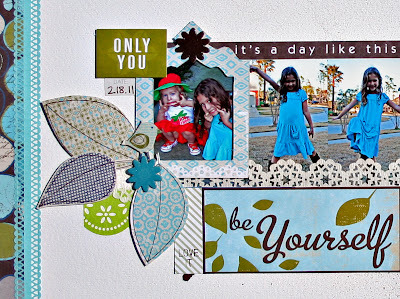 I love blue... this page is perfect! Your photos make me smile. You daughter looks so cute and funny! Love the word strip above the photos and the big focal photo is so cute. Great 2 pager! Such cute pictures! Love your take on the sketch! And I really like what you did with that lace trim! This is so pretty! 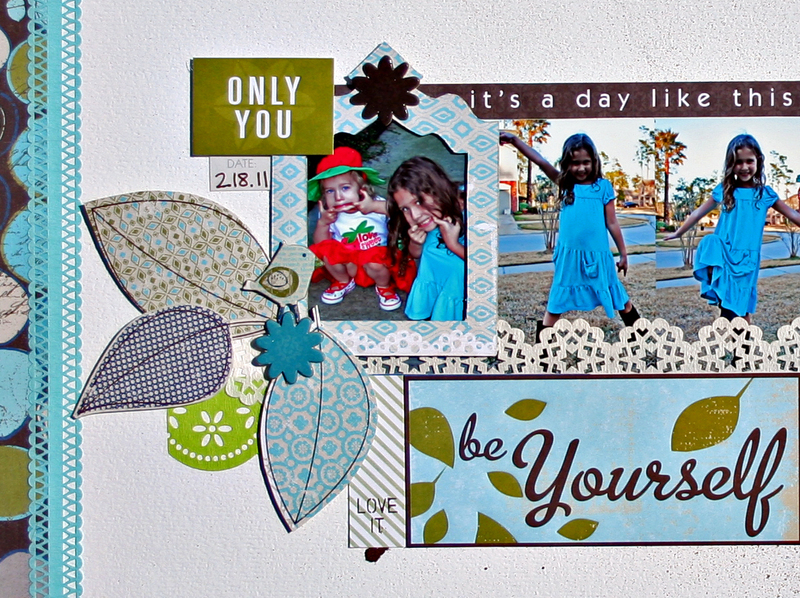 LOVE all the blues and greens for a girl page... totally my style! And those pictures are priceless!